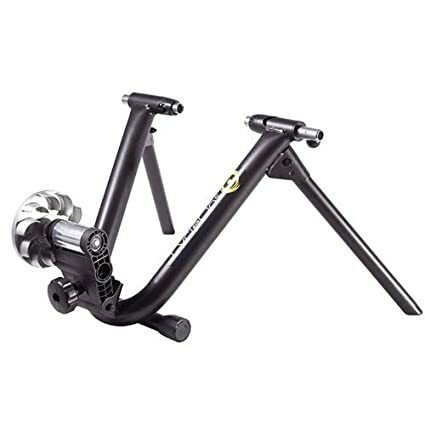 Wind bike trainers are among the most affordable best bike trainers around. Pedaling powers a fan that provides the resistance for the trainer. The resistance increases as the rear wheel spins more quickly either from increasing the cadence or using a bigger gear. Wind trainers are inexpensive and durable, however they are quite loud and the resistance is often limited and does not always mimic a road-like feel. The Cycleops Wind trainer is durable, easily adjustable and has a great warranty. The wind resistance provides a frictionless ride. With an affordable price point, the Cycleops is one of the best wind trainers around. Rollers are a type of trainer that require the rider to have great balance, an engaged core and efficient pedal strokes. They take some getting used to, as well as learning how to mount and dismount, but they provide a very realistic and quiet road-like feel. They also have the added benefit of being much more fun to ride than a fixed trainer. The Elite Arion Rollers is one of the best trainers on the market today because it is built with light-weight but tough thermoplastic frame, a step-up for ease of mounting and dismounting, and is easy to fold for storage or transportation. Mag trainers use a magnet flywheel to provide resistance. These trainers are easily adjustable for resistance and are not as loud as wind trainers. The resistance can be manually adjusted from a knob on the flywheel or a handlebar attachment. However, it is possible to overpower magnetic trainers on the toughest setting as your fitness improves. For an average cyclist looking to log some miles through the winter a mag trainer can get definitely get the job done. The Tech Mag 6 trainer from Blackburn comes with 6 different resistance settings, a bar-mounted resistance control and a tubular steel from with adjustable height. This trainer offers durability and is easy to adjust the workload. The Blackburn Tech Mag 6 is one of the best magnetic trainers on the market. The Blue Motion magnetic trainer from Tacx is one of the best trainers around since it offers 10 positions of resistance, taps out at a whopping 950W, and the flywheel mimics a realistic pedal stroke and road-like feel. Fluid bike trainers have a flywheel mechanism that’s driven by the bike’s rear wheel, but it creates resistance through fluid spinning around in the flywheel. As the temperature increases, the fluid becomes thicker, so when you pedal faster the trainer resistance becomes more of a challenge. Also, in conjunction with that, as the flywheel within the fluid spins faster and faster, the resistance increases on a logarithmic scale which means the harder you ride, the more resistance there is. With this. fluid trainers have the most realistic road feel, they are very quiet, and they have a wide variety of features like pairing to power and the internet. The Rock and Roll trainer is the the top of the line trainer around. With its wide base it offers stability for standing on the bike for a very realistic road feel. It has an electronic control that allows you to do targeted workouts, ride simulations and it pairs with Zwift and Trainerroad. This trainer is super quiet, accurate and reliable. The Rock and Roll trainer also is compatible with thru-axle bikes. The Cascade Fluid Pro is one of the best fluid trainers on the market because it has a thermally sealed fluid drive which is very unlikely to ever have leaks. The trainer is easy to set up; it folds for ease of transportation and it is very quiet so you won’t need to have the volume on max while working out to tunes! Riding a trainer through the winter months can be an efficient way to workout without spending heaps of time dressing in layers and charging lights. Because of the ‘no rest’ periods trainers provide, a 1 hour trainer ride is equivalent to at least 90min out on the road. Trainer riding can be super fun too especially if you have one of the best bike trainers since you won’t have to worry about it failing you in any way. Get a good playlist of music, invite some cycling friends over and be prepared to sweat!